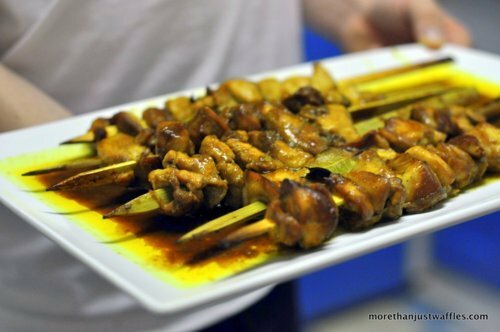 I was inspired to make chicken satay after my mom made some for a dinner party. Not thinking too hard about the ingredients I marinated the chicken cubes (I should’ve cut them into strips like try satay, but, live and learn) in a combination of soy sauce, peanut butter and my favourite spices. For the dip I used a recipe my coworker K suggested from Rebar. K suggested doubling or quadrupling the recipe. Since I forgot the recipe at work (what’s new!) I googled it and found the recipe we had been talking about. Not realizing the recipe was already quadrupled I set on decrupling (is that the right word for x10?) the recipe which yielded a mere litre-and-a-half of peanut sauce. Needless to say I was making a lot of peanutty meals over the following week.